Three new studies led by Narvaez show a relationship between child rearing practices common in foraging hunter-gatherer societies (how we humans have spent about 99 percent of our history) and better mental health, greater empathy and conscience development, and higher intelligence in children. 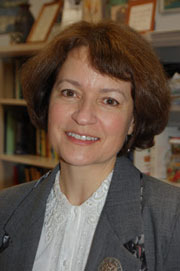 The three studies include an observational study of the practices of parents of three-year-olds, a longitudinal study of how certain child rearing practices relate to child outcomes in a national child abuse prevention project, and a comparison study of parenting practices between mothers in the U.S. and China. The longitudinal study examined data from the research of another Notre Dame psychologist, John G. Borkowski, who specializes in the impact of child abuse and neglect on development. The results of Narvaez’ three studies as well as those from researchers around the world will be presented at a conference at Notre Dame in October titled Human Nature and Early Experience: Addressing the Environment of Evolutionary Adaptedness. “The way we raise our children today in this country is increasingly depriving them of the practices that lead to well being and a moral sense,” she says. Multiple adult caregivers—people beyond mom and dad who also love the child. The U.S. has been on a downward trajectory on all of these care characteristics, according to Narvaez. Instead of being held, infants spend much more time in carriers, car seats, and strollers than they did in the past. Only about 15 percent of mothers are breastfeeding at all by 12 months, extended families are broken up, and free play allowed by parents has decreased dramatically since 1970. “Ill-advised practices and beliefs have become commonplace, such as the use of infant formula, the isolation of infants in their own rooms, or the belief that responding too quickly to a fussing baby will ‘spoil’ it,” Narvaez says. Whether the corollary to these modern practices or the result of other forces, research shows the health and well being of American children is worse than it was 50 years ago: there’s an epidemic of anxiety and depression among the young; aggressive behavior and delinquency rates in young children are rising; and empathy—the backbone of compassionate, moral behavior—has been shown to be decreasing among college students.